This is the second WIP for the RG Zaku II I'm working on for the Texas Gundam Club's mass production unit group build! I'm done with removing the parts from the runners and sanding the nub marks off. Yay! Next up will be primer, then paint! Right now I have all the parts separated in little bins, so next I'll be putting them on clips so I can paint. I think I'm going to label the parts as to where they go and what color I'm painting, just to be sure. 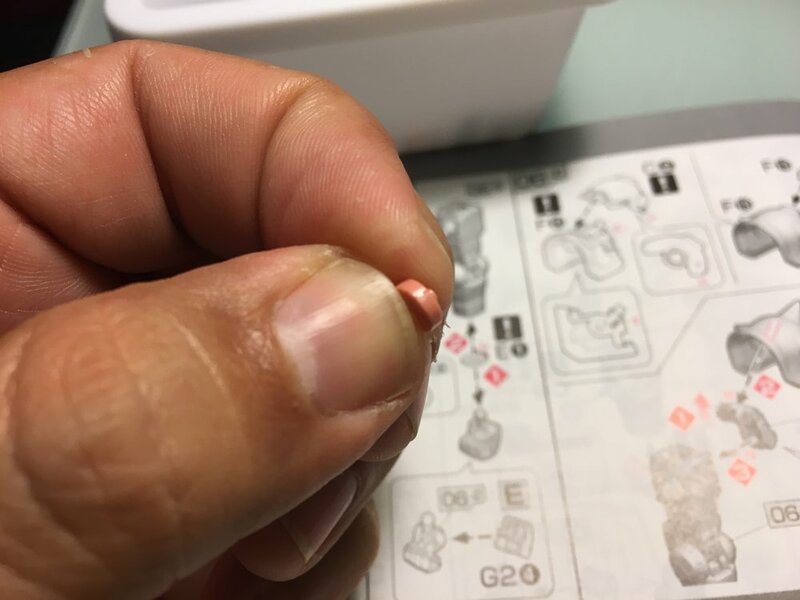 There are a lot of tiny parts and I don't want to get anything mixed up. On to the pics! Look at that tiny nub mark! Away! Here's a piece of the shoulder with nub marks and a line from the injection molding down the middle. This won't do! Much better. After some shaving with a hobby knife and sanding it's nice and smooth. There are still little marks that are barely visible, but since I'll be painting this kit they'll be covered up. What matters most is that the surface is smooth and even. How to remove nub marks from a tiny piece? If it has a hole through it you can put it on tweezers or a tooth pick and sand away. 3 at a time! This kit has about 60 of these pieces, in 2 sizes. So glad this is behind me, but painting them will be a challenge. Here it is, semi snapped and ready for the next step!